The roots of the McKay family include the McLennans – Mrs. McKay's family. Alexander McKay (1800-1887) and his wife Catharine, nee McLennan, emigrated from Uray, Ross & Cromarty, Scotland in 1841. Their son Rhoderick, the subject of this sketch, was born in Puslinch in 1848 on their farm at Lot 18, Front Concession 3 Puslinch. He was my great grandfather. A few years later Alexander purchased Lot 19, Front 3 to expand his farm. By 1855, the McLennan branch built a log house on their Lot 20 property next door. This was a full two stories and larger than the original cabins built on their farms in Puslinch in the 1830s and 40s. Today this log house has been plaqued by the Puslinch Heritage Committee and is owned by Dan Forestell who has a Christmas tree farm there. Rhoderick McKay was both a framing carpenter and joiner as exhibited in the finishing of the Hector McCaig fieldstone farmhouse on Lot 17, Rear Concession 2 across the concession from the McKay homestead. He and a fellow carpenter (name unknown) spent two winters completing the farmhouse, returning to the family farm across the road in the cropping season to help with the planting and harvesting. The framing included constructing the openings for doors and windows, and then the beams, trusses and floor joists. Next the floorboards were laid and three staircases built. Interior window openings and panel doors were completed; then the finishing carpentry began. Using a variety of hand planes, the carpenters molded the edges of planks to be mounted as decorative trim for interior window and door frames. Eight doors led off the large farm kitchen alone and they built wainscoting to chair-rail height around its 20 foot by 22 foot perimeter. Then doors and windows were needed for the 14-room house plan, some with two windows like the parlour and front room. It is no wonder that it took two winters to complete their work. 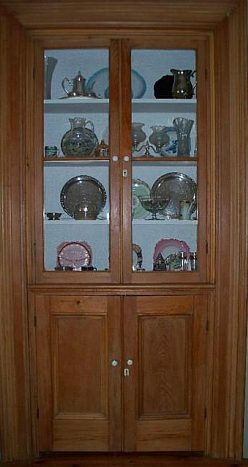 The showcase of these carpenters' skills was a 14-foot high, built-in china cabinet in the dining room, complete with all the elaborate moldings used in the rest of the house. Native red pine lumber was used throughout this 1875 home. This, however, did not mean that the carpenters' work was completed. The exterior of the house received their attention next. Decorative Victorian-style bargeboard, popularly referred to as “gingerbread", was cut to embellish the two gables and the porches, and finally summer screen doors and wooden storm doors were built to protect against the extremes of climate in a Canadian landscape. While plain plank storms were built for the side and cellar entrances, the main storm door of the farmhouse was more elaborate. Built to protect the front hall and its door with transom and sidelights which faced north to the 3rd Concession road, this door appears on the Puslinch Heritage Committee's 2004 “Doors of Puslinch" poster, as one of only two storm front doors that remained in the township at the time of the millennium plaquing program. The elongated double–pentagon shaped windows in the storm's outer frame were built to allow light into the main hall in winter, and the inner plank door was removable and replaced by a screen in summer. As the final touch, shutters were added to the 21 windows in the fieldstone house. It is possible these were purchased from another area carpenter who had the jigs required to specialize in these operative shutters, but they may have made by Rhoderick and his partner themselves. Known as "Rory" McKay, Rhoderick was in his late 20s when he worked on the McCaig farmhouse. This 1875 site was plaqued in 2000 in the Township's millennium program, as was the fieldstone farmhouse built on the McKay homestead in 1860. Rhoderick would only have been 12 years old when their family's house was being built, but no doubt its construction was the beginning of Rory's training in carpentry. Rhoderick and his wife Barbara, nee Wilkinson, had 13 children – the youngest being born on their 25th wedding anniversary! Sons Alexander (“Sandy") McKay and his brother Gordon apprenticed with their father. A second-stage frame house had been built on the McKay homestead in the 1840s to replace the original log cabin before the larger fieldstone farmhouse was built in 1860 on Lot 19. While the senior Alexander and his wife Catherine moved into the stone house with their children, Rhoderick and his wife Barbara later inherited the frame house. Rhoderick died in 1895. His widow Barbara and her family still lived there in 1922 when the frame house burned to the ground. Since her sons Sandy and Gordon were accomplished carpenters by then, they built another frame house that was later severed to become the current Forestell house. The carpentry work in two other well-known local sites are attributed to Rhoderick McKay's sons, Sandy and Gordon. They did the carpentry work in the renovations of Duff's church in 1903. We all climb the staircases they constructed whenever we enter the sanctuary from the main entrance. They also worked on the 1906 addition to the earlier 1860s Alexander Smith stone farmhouse on Lot 22, Rear Concession 2. Today this house is being renovated by Chad Hayden and his wife Nicki Islic as part of the Heritage Lake Estates on the former Smith farm at the Hanlon Expressway and Highway 401. Mrs. Alexander Smith was Euphemia McKay, a sister to Sandy and Gordon. Sandy and his wife moved to British Colombia in 1907. He worked as a carpenter all of his life in both Canada and the United States. He worked on the U.S. fortification buildings at Pearl Harbor and in San Francisco. The family lived in the North Shuswap District of B.C. and while there Sandy designed and built the picturesque St. Mary's Church at Sorento, B.C. It was through the family connections between Alexander Smith and the McCaig family on Lot 18, Front & Rear Concession 2 that the Smiths eventually took over the James McCaig farm on Lot 18. Today I am telling Rhoderick's story as a direct descendant of Rhoderick McKay through his daughter Euphemia, Mrs. Alexander Smith. Researched by Lynn Crow, P.H.S./P.H.C.